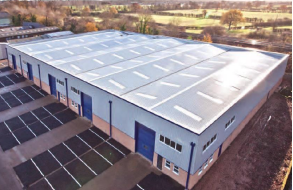 The site comprised of an existing industrial unit located on the Budbrooke Industrial Estate in Warwick. The client had planning permission to redevelop the site with the construction of a new unit. Previous site investigations had identified contamination associated with historical manufacturing activities on the site (a precision engineering firm). The engineering firm utilised degreasing baths to clean metallic components – these degreasing baths contained chlorinated hydrocarbon solvents (predominantly trichloroethene). The identified contamination was organic in nature and comprised of both total petroleum hydrocarbons and chlorinated solvents – it was assumed that these contaminants has entered the underlying soils and associated groundwaters through leakages and spillages from degreasing / other manufacturing operations and from chemical storage. The contamination had the potential to pollute the adjacent Gog Brook and henceforth it was necessary to carry out site remediation. The Gog Brook flows from north to south along the western boundary of the site within a concrete channel. The Brook then flows directly under the southern section of the industrial unit. The brook then emerges at the south eastern corner of the site. This is the new course of the Gog Brook. The old course was diverted to enable the construction of the original unit. The old course of the brook was backfilled and the resulting channel was overlaid by hardstanding within the existing unit footprint. This channel was infilled with relatively permeable material (more permeable than the surrounding natural ground) and is considered to be a preferential pathway with the potential to transport mobile pollutants to the south eastern corner of the site and ultimately into the current course of the Gog Brook. In addition to the need to address the contamination pathway associated with the old course of the Gog Brook, it was also considered necessary to remediate four contaminated areas to achieve effective site remediation as a whole. The site is predominantly covered by hardstanding and as a consequence it was not considered necessary to remediate the site for human health protection (as there is an effective pathway break in place).